Park visitors to Alderman&apos;s Ford Regional Park can now rent a canoe to explore this scenic park in a different way. Four-hour rentals are offered at $25. A park entry fee will also apply at $2 per vehicle carrying up to eight people, and $1 each additional person. Only cash, check and traveler’s check payments are accepted at this time. Alderman&apos;s Ford Regional Park is open seven days a week from 8 a.m. – 6 p.m. during the winter months. Canoes or kayaks can be rented on site at each entry station. Rentals at Upper Tampa Bay Park are conducted within the on-site environmental studies building. Those wishing to rent a canoe or kayak must be 18 years old, and complete a liability release and rental agreement form prior to payment at the entry station. 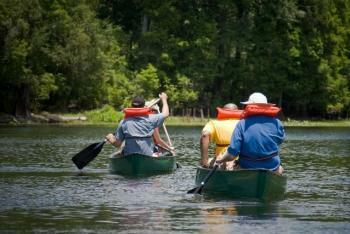 Hillsborough County started offering canoe/kayak rentals in Sept. 2010 at the request of park visitors. For additional information, contact Hillsborough County Parks, Recreation and Conservation, at 813-757-3801. This scenic regional park includes the area where the Alafia River branches into its north and south prongs. The Alafia River is one of the most popular canoe spots in the state. Several picnic areas are connected by a pedestrian/bicycle loop path. This path, together with the boardwalk and foot bridges, is perfect for a self-guided tour as it provides a first-hand view of Hillsborough County’s abundant flora. The main picnic area has nine shelters for family or group use, and an enclosed, air conditioned pavilion for large gatherings. All are available for rental by calling 635-3500, option 2.